On #MaintenanceMonday, I try to help you give your bod a little extra TLC. This week, it’s a deceptively simple move that may teach you some surprising facts about your shoulder mobility! 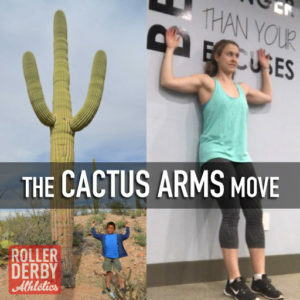 “Cactus Arms” will either feel nice, but pretty easy, OR you will discover you have a significantly limited range of motion on one or both sides… Keep reading for some advice on how to deal, if you’re feeling locked up. When you do the cactus thing, you want to have your whole back leaning against the wall, and your whole forearm in contact as well. To facilitate this, I set up with my feet about 6″ away from the wall and lean back onto it. Only bring your upper arms down to parallel with the ground. In other words, a 90 degree bend at the armpits, and 90 degrees at the elbows. 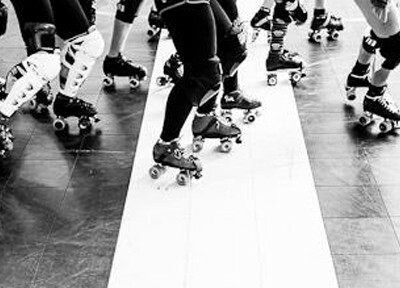 Slide your arms up the wall, without lifting your back away, as high up as you can. Return to the start. Repeat 10x or more. This stretch is especially timely because TODAY, April 3 my Sun’s Out Guns Out Upper Body Challenge is starting! There’s still a chance to get in last minute and work with me to build your upper body and core strength. You’ll be needing some extra #MaintenanceMonday all month long with all the hard work we’ll be doing on our arms, shoulders, and backs! ==> For more details on the SOGO Challenge, click here. When to do this: Before any practice where you’ll be bracing; before any upper body workout, especially one with overhead lifting involved! Sets/Reps: As a warmup, do 8-10 reps. To work on improving your mobility over time, do a set of 20 to 30 reps daily. A standard arm-overhead triceps stretch is a good one. Leaning against a wall or laying down with a lacrosse ball or tennis ball under the lower-inside edge of your scapula (shoulder blade) and rolling the ball back and forth can unlock some muscle tightness. Child’s pose and Downward Dog in yoga can really help. Experiment in child’s pose with turning your thumbs to face the ceiling, and then rotating them inward as far as you can too. Check out some more suggestions here from Breaking Muscle. If any of this hurts or feels “crunchy” then back off. If your shoulders bother you in sports or everyday life, see a physiotherapist to find out the best course of action for you. Did this mobilisation surprise you? Let me know in the comments! PS: You can get all of the #maintenancemonday videos here.